Accessory Dwelling Units (ADUs) provide much-needed housing in an environmentally friendly way, but state building code requirements, including the 2016 Energy Code, can create barriers for property owners interested in building ADUs. 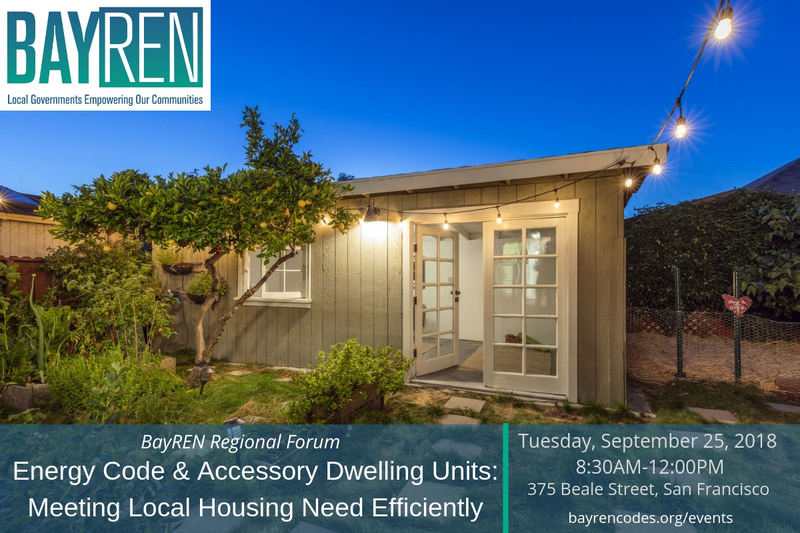 This forum will include a series of presentations from industry experts and government staff about the energy code requirements for ADUs, the role of ADUs in providing housing in the region, and no-cost resources for facilitating the construction of energy-efficient ADUs. Lessons Learned from ADU Projects in the Bay Area | Kevin Casey, Founder & CEO, New Avenue Inc.
ADUs, Energy Efficiency, Conservation & Waste Prevention | Kol Peterson, Owner, Accessory Dwelling Strategies, LLC.